CINCINNATI -- Peg Wyant looks at decaying buildings and sees potential. The first time she saw the hulking, old Strietmann Biscuit Building on West 12th Street, she saw nearly 100,000 square feet of it. 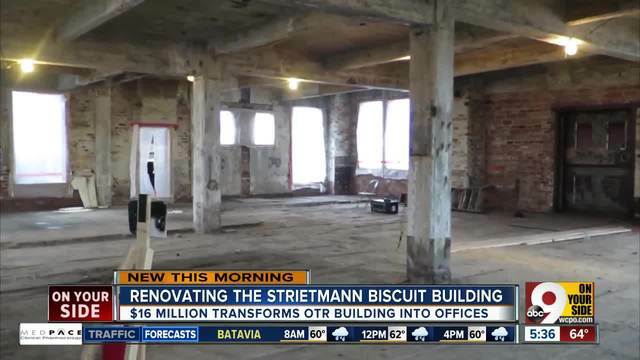 That's why Grandin Properties is transforming the old bakery into The Strietmann , one of the biggest office buildings in historic Over-the-Rhine. At a cost of nearly $16 million, the redevelopment will be the single largest project the company has ever tackled. An original Strietmann bakery box. "It's a little scary from that standpoint," said Wyant, Grandin Properties' CEO. "But I think we're well prepared to handle it." Wyant is counting on other well-prepared local businesses to help, too. She said she aims to steer roughly one-third of the project's contracts to businesses owned by women or minorities. "Women and minorities tend to be an overlooked asset, and they'll actually do a better job," said Wyant, a woman business owner herself. "I have a lot of faith." 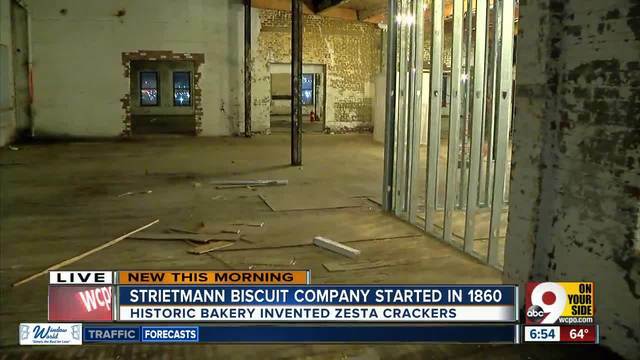 The company's investment also reflects faith in Over-the-Rhine. That makes sense, said George Verkamp, a Sibcy Cline Realtor who has extensive experience with commercial property in the neighborhood. "It's the hottest area in Cincinnati," Verkamp said of Over-the-Rhine. "There's a lot of interest and a lot of activity there, and Peg is a person that knows what is needed." 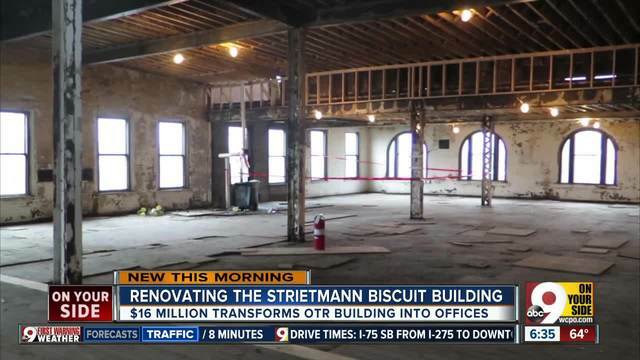 To give the public a better idea of what it will take to restore the seven-story property, Grandin is giving WCPO access to The Strietmann project from start to finish to document the work involved. This is the first installment. Work on the project began in earnest about three months ago, but there is still plenty to be done to have the building occupied before the end of this year as Wyant intends. The Strietmann is designed to have restaurants and retail space on the first floor with showers and places to park bicycles in the basement. This is what the interior ground floor level of the building looks like now. A staircase to the second floor leads to the bakery's old corporate offices and original woodwork that was part of those spaces. Each floor has about 15,000 square feet of rentable space. The floors are large, open areas with big windows. This is the third floor as it looks now. Bathrooms are being roughed into the same general area on each floor. Some day this area will be bathrooms on the third floor. The fourth floor has some old, metal fire doors that are being incorporated into the project's design. Old, metal fire doors on the fourth floor. The fifth floor has especially high ceilings and a skylight. Skylights bring even more natural light into the fifth floor. Grandin will create two common areas on the seventh floor with a kitchen. Before the end of the year, this space will become a common area with a kitchen. These three windows offer a view of what will become a rooftop terrace. The space outside of these three windows will be a rooftop terrace. This view is from a part of the roof where solar panels will be located. The Kroger Building is visible off to the right from the rooftop of The Strietmann. Wyant talks about the views with the same enthusiasm she brings to the rest of the project, which she expects to draw creative businesses and young employees who will want to work near the restaurants, shops and cultural attractions that are just a short walk away. And while the pigeon droppings and garbage have been mostly cleared out of the structure, it still has a long way to go. "I have a different kind of vision. I see the way it's going to look when it's finished," Wyant said. "And when I look back and look at the pictures of the way it starts, I think, 'Oh my gosh. Why did we buy that building?'" Before the end of this year, Wyant expects The Strietmann to be finished so the rest of the city can see the project the same way she envisioned it when Grandin bought the place. The Strietmann, the tall structure to the right of the photo. More information about The Strietmann is available here . 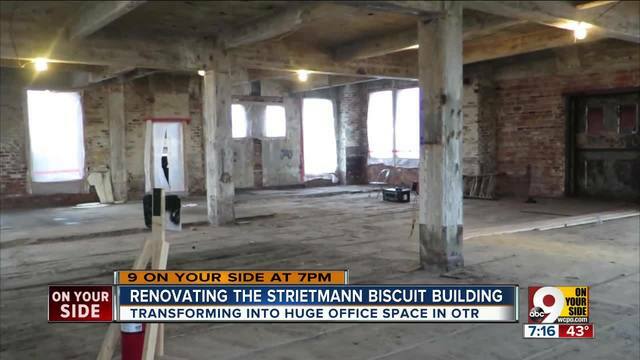 WCPO will continue to follow the redevelopment of The Strietmann throughout 2017. Lucy May writes about the people, places and issues that define our region – to celebrate what makes the Tri-State great and also shine a spotlight on issues we need to address. She has been writing about women- and minority-owned businesses in Greater Cincinnati for nearly 20 years. To read more stories by Lucy, go to www.wcpo.com/may . To reach her, email lucy.may@wcpo.com . Follow her on Twitter @LucyMayCincy.